The final installment of my four-part series of articles discussing the different components I use to create my artwork will focus specifically upon the brushes that I have come to rely upon. My brush selection has developed over time and is the result of extensive experimentation with several different offerings from select manufacturers. 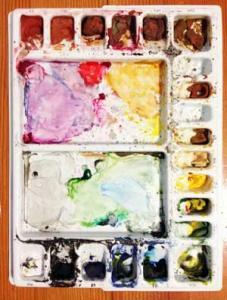 As an extension of an artist�s hands, brushes can be a very important variable in the creative equation. While some artists prefer synthetic brush hairs, others may prefer natural hair or a blend of natural hair and synthetic filaments. 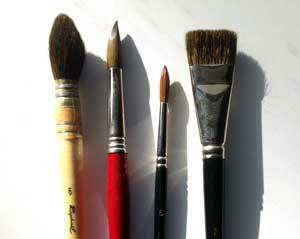 Regardless of material preferences, however, brushes can be a fairly expensive investment. Professional artists often amass a large selection over the course of their careers before eventually settling upon specific requirements or preferences. As can be observed from the image at the top of this post, I have also collected a large number of brushes even though I have only been painting with the watercolor medium since 2004. 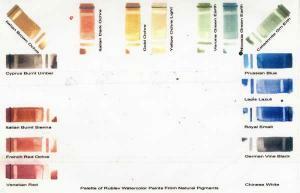 Written to parallel and supplement Part IIIa of this four part series of watercolor painting equipment articles, this text will illustrate the palette selections I have made utilizing the paint brands discussed in my previous post. It is often just as interesting to see what particular palettes an artist has constructed as it is to know the brand of paint they use. Before I utilize nearly every new palette, I create a test sheet. I try to test the paints on the Arches 140# cold-pressed watercolor paper that I regularly use and often will lay the test swatches out on the paper in the same manner in which they will occupy my palette. As I no longer use a palette with individual wells in favor of a bare enameled butcher tray on which to mix and utilize paint, my newer paint test sheets are a bit more haphazardly organized. As Part II of this series of painting equipment articles indicated, a tightly stretched substrate is my preference for watercolor work in order to minimize buckling of the paper during wet wash applications. Even more important to my painting technique than the substrate, however, is my choice of paint. Over the years, I have utilized numerous brands of paint and admire several for their unique characteristics. I often choose a palette from a specific manufacturer based upon the character I wish a particular watercolor painting to emote. I prefer heavily granulating natural pigment paints for textural pieces or works depicting metallic objects. Conversely, I often choose very vibrant, heavily pigmented paints that possess very minimal granulation characteristics for floral work. One of my early favorites consisted of a selection of Winsor & Newton tube paints housed in a Guerrilla Painter brand covered palette. The plastic palette worked nicely and I still return to the Winsor & Newton paints on occasion. The company�s Opera Rose will always be one of my favorite colors for floral work. 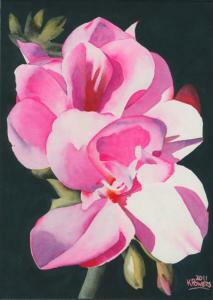 I receive a lot of inquiries from fellow artists regarding how my Powers Fine Art Studio website operates. While there is a lot of custom coding in place, there are also some really nice WordPress plugins implemented to help accomplish many of the site�s basic tasks. I thought it would be fun to share some of the plugins I use with my self-hosted WordPress installation since I have experimented with many others and these particular ones have proven to be my most trusted. Do you have WordPress plugins that you find to be indispensable? If so, feel free to list them in this article�s comment section. I would enjoy hearing what other WordPress users are implementing. As I mentioned in the first part of this series of painting equipment articles, artists make unique decisions regarding the equipment they select to create their artwork. 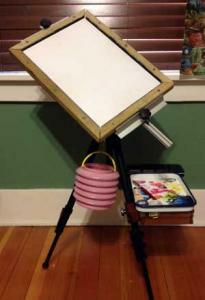 Part I focused specifically upon the creation of an adjustable easel system designed to support a watercolor paper stretching board. While many artists find no need for a paper stretching device, I really prefer the buckle-free surface that stretched paper provides. The very wet washes I often use for a painting�s background dry more evenly without pigment settling into troughs created by a slightly wrinkled paper. 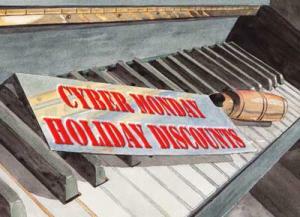 Black Friday, Small Business Saturday, and Cyber Monday have all become established phenomena in our modern retail world. While all of these are designed to increase a business� revenue by slashing prices, some establishments take the concept to an extreme. The past couple years have seen these marketing opportunities stretched to well-before and well-after their traditional time-slots and it can be difficult for a small business to attempt to have a marketing plan that incorporates all of these dates. Readers who have been following my artistic career for the last few years know that I prefer to use Fine Art America as my main print fulfillment partner. In the time I have been utilizing their services, however, I have never purchased one of my own prints. In fact, I have only seen one of my own prints from the company on a single occasion. To this date, I have never had a customer return a print to Fine Art America and with a 30 day �no questions asked� return policy, I have always had confidence in the products they were producing. I recently had the opportunity to participate in an online contest designed to help Fine Art America promote its services through the use of the Twitter social-networking community. To my surprise, I achieved the number five position in the top 10 list of winners and received a $75 USD gift certificate. After some deliberation, I decided the gift certificate was a great opportunity for me to purchase a print of my work in one of the more intriguing formats that Fine Art America offers and to discuss some elements of the purchase that have further solidified my confidence in maintaining Fine Art America as my main print fulfillment partner. I promised in an earlier post that my articles would not be exclusively based around technical information or website development and this post is going to be the first to deliver upon that promise. In this first installment of a four-part series I plan to discuss the painting equipment I use as an artist and address the reasons for my selections while comparing some of my previous choices. An artist�s selection of equipment is as individual as the artist themselves and mine is no exception. My watercolor painting setup was designed based upon several key criteria and as my style and techniques have developed over the years, my criteria have changed as well. Currently, I have opted for a very sleek, streamlined, and portable configuration that works equally well in the studio as it does outdoors in a plein air situation. 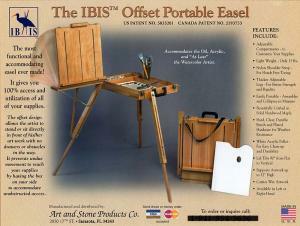 This particular post�s primary focus is specifically on my choice of easel configurations. 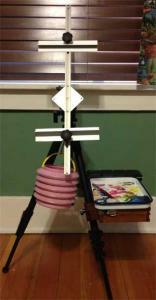 Part two of this series will address my choice of paper stretching devices and why I use them. Part three will speak about several of the brands of paint that I use and their unique characteristics and Part four will talk about my limited choices of brushes and why I use what I use. I am fully aware that it has been a couple of months since my last blog post but I am intent upon striving for quality content instead of quantity. 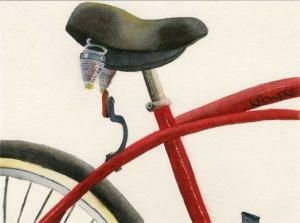 It is important that this web blog reflects my journey as an artist, the trials and tribulations of creating a WordPress-based online e-commerce site, and information concerning the various equipment and techniques I use to produce my original watercolor artwork. When it comes to painting equipment and materials, I am generally experimenting with new products. Recently, however, I made the decision to extract one of my old portable easels from storage. Although I love my usual setup, I wanted a little more equipment storage capacity and working space than my current configuration provided and my old Ibis �Offset� French-Style Easel is the perfect candidate. It is once again the time of year when the official �Call For Artists� for the next Twitter Art Exhibit is released. If you haven�t read the interesting history of this amazing yearly charitable event, make sure to read my previous Twitter Art Exhibit article that chronicles the brainchild of Norwegian artist David Sandum. The fourth Twitter Art Exhibit event is slated to be held 20 March 2014 in Orlando, Florida USA at the CityArts Factory, Magic Gallery. The organization to receive 100% of the proceeds from the exhibition is the Center For Contemporary Dance, Special Needs Classes. The non-profit organization is dedicated to dance education and outreach while providing customized exercises designed to expand students� range of motion, creativity, and social skills. Additionally, class work is created to enhance memorization, problem-solving, and communication.